A new climate report has revealed a surprise opportunity to grow low chill temperate fruit, like stone fruit, in the Pilbara – a region renowned for its extremely high summer temperatures. The Department of Agriculture and Food’s Climate in the Pilbara report on the potential for irrigated agriculture development notes there are areas that could accumulate enough chill units, usually associated with mild climates, to grow such crops. Department Irrigated Agriculture Executive Director John Ruprecht said the revelation added to the diverse range of high-value horticulture development opportunities in the region. “The Pilbara is well known for its scorching summer temperatures, but we were also surprised to discover the region has a chill factor,” Mr Ruprecht said. The Climate in the Pilbara report brings together the best available information to describe the climate characteristics of the region, what factors drive the climate and how the climate may change in the future. The report provides a succinct, user-friendly summary of the region to potential investors to better understand how the weather may impact irrigated agricultural development now and in years to come. Mr Ruprecht said a thorough understanding of climate was essential to a successful agricultural enterprise, as temperature, rainfall and seasonality determine what can be grown and when. “Understanding the likelihood and severity of extreme events, such heatwaves and cyclones, is essential to managing risk, not just to people and infrastructure, but for crop production as well,” he said. being the most cyclone prone area along the Australian coastline. Over the past 40 to 60 years, average annual temperatures have increased over most of the state. Climate projections show very high confidence for temperature in the Pilbara region to continue increasing by another 0.6–1.5°C to 2030, with the northwest of the State warming more than elsewhere in Australia. Annual rainfall is projected to remain largely unchanged in future and there is high confidence that natural rainfall variability will remain the primary driver of rainfall changes to 2030. The Climate in the Pilbara report is part of the department’s work in the Pilbara Hinterland Agricultural Development Initiative (PHADI), made possible by Royalties for Regions investment through the Pilbara Cities Initiative. The department works in partnership with the Pilbara Development Commission and Department of Regional Development to deliver the project. PHADI aims to help government, industry and investors better understand the potential of irrigated agriculture in the Pilbara. 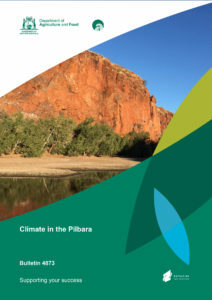 The Climate in the Pilbara report is available at agric.wa.gov.au by searching for ‘climate in the Pilbara’. The Department of Agriculture and Food’s Climate in the Pilbara report has shown the potential for a range of irrigated agriculture developments, including low chill temperate fruit, like stone fruit.